Evil robotic spiders from the future versus an acrophobic super cop! This tacky sci-fi thriller from the 80s was written and directed by Michael Crichton. Yes, before he took off with big-budget projects like Jurassic Park, E.R or Disclosure. Crichton made tacky movies like Looker and this one. But there's one constant in his work - Conservative Technophobia! And even though this was pre-marketed with great fanfare, James Cameron's Terminator completely nailed it. 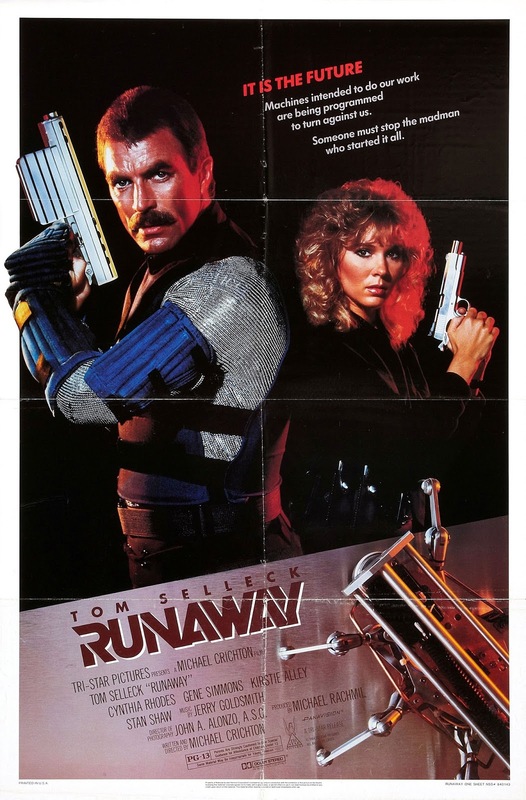 Tom Selleck plays Jack Ramsey, a cocksure cop on the Runaway squad. A few years earlier, Selleck passed on the lead in Raiders of the Lost Ark in favor of High Road to China. Apparently, he didn't learn from that mistake. Smart moustache, foolish choices. The very blonde Cynthia Rhodes plays Jack's new partner, who can't stop drooling over him. (Just like she threw herself at John Travolta in Stayin' Alive). Together, they hunt and kill robots on the rampage! Technology is bad. It's supposed to be the future, and robots are working as maids and construction workers, so why are the cops driving Ford Tempos? Big Problem with this movie: robots aren't very scary. If you don't believe me, rent breastcentric filmmaker Jim Wynorski's Chopping Mall (1986), a cheesy horror movie where robot security guards zap teens with lasers. Although the movie is set in a mall, there is no chopping. I felt gypped but its at least good fun. But I digress... Jack, a widower, has a young son and a robot housekeeper named Lois. She looks a lot like Rosie from The Jetsons. "Lois, you can't keep giving him hot dogs for dinner," says Jack. "It is all he would accept," says Lois. Jack's partner warns of the perils of the older model maidbots: "My mother had a Series 10. It kept burning the toast." or so the dialogues run. KISS fame Gene Simmons is miscast as Dr. Luther, the mad scientist who is making the robots wreak havoc. He's got a big gun! It shoots heat-seeking bullets that can go around corners in pursuit of their targets! "You've heard of a bullet that has your name on it? Well, this one really does." Without the aid of his KISS makeup and costume and axe bass, Simmons has trouble being menacing. Even though he leers and over-acts, the other characters feel the need to keep reminding us that he's the villain. "This is a bad guy" "He's evil, I'm telling you!" "His name is Luther...like Lucifer." Luther launches little spider-like robots on his enemies. They're kinda cute. "My little machines will follow you wherever you go. They're loaded with acid!" C'mon, Gene, show us your tongue just once. No? You're no fun at all. A cute looking Kirstie Alley plays Luther's secretary/girlfriend who helps Jack track down Luther, then reconsiders and begs forgiveness. Luther kisses her, then stabs her in the back of the head! Yeah, her head! In the first reel, we're told that Jack has only one weakness as a supercop - he's pathologically afraid of heights. How ironic that the finale takes place at a skyscraper construction site! Luther has kidnapped Jack's son and climbed to the top. And the spiderbots are everywhere! RENT IT YOURSELF to see the exciting conclusion. I'll tell you this much--the spiderbots kill somebody and it's not pretty. I won't tell you who, but apparently they like ham. Also watch out for Jerry Goldsmith's great score, it was his first all electronic soundtrack.